I'm stuck in Minniapolis for a layover and got tired of working on my conference paper so I thought I would write a review of the Kiwanis Trail I did my long run on last week. The Kiwanis Trail is a rails-to-trails path that runs from Adrian, Michigan to Tecumseh. It's a paved path approximately 7 miles long and originates at Trestle Park. The park is itself worth a short visit as it has a multilevel boardwalk, is well kept, and modern. For you longer runners it also has a fully functional restroom and water fountain. The path is excellent for running and takes you through a combination of rural residential and farmfields. Scenery isn't anything spectacular with a few rusted out cars decorating backyards. Still, there aren't too many road crossings and most of the path is shaded, which is great in the summer. There is at least one additional water/restroom stop about half-way down the path at a church that was recently constructed adjacent to the path. They welcome visitors and offer a parking lot that could serve as another starting point. The church is just off of SR52 on Valley Rd. There is a shooting range approximately 5 miles north of Trestle Park. While I haven't noticed any bullets whizzing by, Casey doesn't like shooting so I try and keep this in mind. Traffic on the path can be somewhat heavy the closer you get to Adrian, but in several runs, I've primarily encountered bicyclists closer to Tecumsah. As with many people, I prefer loops, but this trail definitely makes for an easy and pleasant run in the country without having to put up with the road-kill of a country road. It's a website with free mp3 based training programs. Basically, there is a combination of music and training advice. I haven't tried any of them yet, but they have some VO2 max tests and other things that would fit well into my mp3 related running addiction. 20 miles yesterday with no ill results so I'm feeling pretty good about my training schedule. It roughly follows the 10% rule, keeps me home with my family, and appears to be keeping me injury free so far. Still, its a work in progress so I'm open to suggestions from anyone out there in cyber land. Heck, feel free to post your own schedules or email them to me and I'll post them. I've been tracking my internet traffic and some of my efforts have been paying off as I've gotten at least a few people who have wandered over here from external sources. Anyway, I'm leaving on Wednesday for a conference in British Columbia and I need to get a paper finished, pack, and do all those other miscellanious things so that's all for today. The next post might be my first international missive! How important is your base? Holli and I were out of town celebrating our 5th anniversary so this post comes a bit late. I had a great 10 mile run on Thursday, which was nice since I was really feeling bad the previous day. I had some muscle soreness and was really tired so I'd started to wonder if I was ramping up my mileage too quickley. However, since a good night's sleep seems to have taken care of it, I'm not sure this was the problem. More likely it was the rash of push ups and sits ups I'd opted for a couple of days ago. I've discovered a new blog, Philedippidations. It's largely about running by Steve Runner who does the podcast while running. Cool idea. I've only listened to two episodes, but I recommend checking it out. Go to http://www.steverunner.com/ for more info. Steve's podcast got me wondering about the importance of having a strong base before starting training for a long distance race. He made a comment that he was working on building his base up to 50 miles before he starts marathon training. 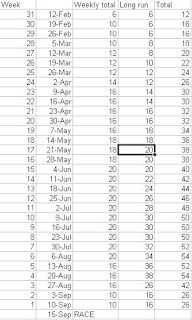 I realize that common knowledge lends itself towards this approach; however, to be honest, my base weekly mileage was in the order of 20 miles per week when I started ramping up my long runs in preparation for the race this fall. Furthermore, if you have been paying attention, I rarely run more than three days a week (although I will probably shift to four soon). I'll post a copy of my training plan soon, but I am currently not planning on running more than 20 miles or so in excess of my long run. This isn't a typical training plan. I think that a great deal can be learned from reading about other people's training plans and particularly those of experts can be useful. That being said, I think that it is important to alter plans according to indvidual needs and goals. My two goals are to complete the ultra safely and to do so without sacrificing a great deal of time at home with my family. Time isn't really an issue. If I feel tired, I go more slowly. If I feel good, I run faster. I should note that I am fortunate in being able to recover well and have never suffered any serious injuries. I think that being able to bounce back quickly means that I haven't had as much trouble ramping up mileage on a smaller base. At least that's what I hope--nothing hurts yet. 20 miles tomorrow. I've posted a banner on the top of my site. Okay, it feels a bit like some corporate sell-out, but it also seems like an easy way to potentially generate additional contributions. Any money I make from people clicking on the link will be donated to the Lupus Foundation. I've decided to try and pick a topic for my postings. I mean, unless I've had a wild adventure like dodging wild geese, you can only read the phrase "ran 8 miles" or whatever. Watched the movie "The Long Run" (2002) today. It's a fictional account of a young woman who is discovered by an old coach who decides to train her for the Comrades, a famous 100k run in South Africa. It wasn't a terrible movie, but it definitely wasn't overly exciting. I mean, if you are spending the afternoon watching a one-year-old and there isn't anything else on I would recommend it. If you like running, you might like it. Frankly, its a very character driven movie--so not really my style. There was some pretty scenery, but even if it would have been a bit cliche, I would have liked more stock elements from the generic sports movie. The characters were okay, but if you are looking for an inspirational running movie, look elsewhere. Okay, I think that I'm becoming obsessed with my feet. I bought a new pair of shoes on Saturday (good thing that we live right next to a large outlet mall with lots of shoe stores.) I was worried about doing 18 miles on trail/gravel road when I've been feeling a little too much of each stone with my other shoes. So I went to the North Face Outlet and got a pair of Philters for $30. They are really multisport shoes with special drainage ports in case they get wet. I like them because they are really light, but definitely sturdier than my other shoes. So anyway, I tested them on 18 miles at Shiawasee yesterday (yeah, I know that most people break in new shoes before long runs). I had a back up pair of shoes in my truck, but I was pleasantly surprised with these. They were very breathable, which was nice since I hate it when my feet get hot, but provided enough support. The weather started out a little cool (50+ degrees and cloudy), but the sun was shining by the time that I was done. I had an encounter with some angry Canada geese, but other then that the run was pretty uneventful. I definitely need to start carrying more water though as even in cooler weather I seem to drink a lot. Next week, I'll start a streak of 20 mile long runs and keep it at that for a few weeks. The weekly mileage increases are going pretty well, but I don't want to push my luck too much. I contacted a few different companies about donations this weekend and am waiting eagerly to hear from them. I'll wait a bit to see if I hear from them, then I'll start looking into contacting some local businesses too. If you are checking this blog on a regular basis--and I know of at least a few of you are--I'd encourage you to leave me a comment by clicking on the "comments" link at the bottom of each posting. I'm ramping up recruitment of business sponsorships and would like to be able to show that there would be some exposure involved in donating to the Lupus Foundation. Well, that and it would be great to hear from you. Thanks to those who have emailed me support! After a near freeze last night we are back to sunny skies and warm weather. 4 miles with the dog and another 2 just with Elliott. Nothing too new to share, but here's a photo of Elliott right before he went out in his haz-mat suit. Living this close to Dow Chemical, maybe all of us should get haz-mat suits. Seriously, the little guy loves to be outside. We went for a 6 mile run yesterday even though it was cold out--we both were feeling too cooped up inside all day. Today we are off for a walk with the backpack. Only 7 miles today. I decided to cut it a little short since Elliott hasn't been feeling too well the last couple of days and is only starting to get back to himself today. The cool thing is that yesterday we got a package in the mail from Campmor. For me was a new pair of sunglasses, much more comfortable than the ones I had been using. 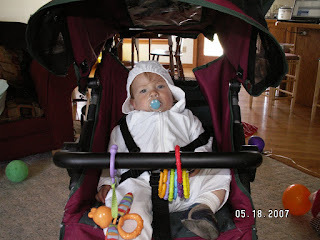 For Elliott, a baby suit made of special sun-protective clothing. Okay, it makes me feel a little like one of those over protective parents, but then again applying sunscreen is so much trouble and I'd like to take him with me on some of these multiple hour runs without worrying about the little dude getting sunburned. The coolest thing is that the thing looks like a little baby hazardous material suit. Yeah, so basically Elliott looks like Homer during the opening scenes of the Simpsons at the powerplant. I'll post a photo soon. The trip really gave me a hankering to go backpacking, which Holli and I haven't done in quite some time. Although as heavy as this guy is getting I'm not sure how easy such a trip would be. Basically, it would require Holli to carry nearly all of the equipment for her, Elliott, the dog, and myself. Maybe we could teach the dog to drag a sled. 18 miles yesterday. I decided to run on Saturday since today is Mother's Day. At this point I need to get creative to find a route. I was going to run to Holli's new office in the town just north of here, but I started running out of water so I headed home to refill before going out for another loop. Since Grammy was visiting, Elliott didn't go with me, which was probably good since it was really windy and as much as I like jogging with the little dude, its nice to get a break too. 9 miles today. It was a nice run although it started out cool and foggy and suddenly turned hot after the sun came out. Elliott went with me and slept the whole time. I think that my metabolism is starting to speed up or, well, the miles are just catching up with me. I feel like I've been eating all the time lately. The good news is that I picked up a new running shirt today to send off to Scott's printer to be silkscreened. He's going to use a photo of me in the shirt to help promote my donation site. Again, I can't thank him enough. Go buy his books if you haven't already! On the down side, neither I nor World Lupus Day made it into the news even after Holli and I emailed a half dozen press releases to local newspapers and TV news. I've dealt with the media through my past union activities so I know its a hit and miss sort of thing. I'm not overly disappointed. That being said, one channel did run a story about a skateboarding dog, which just reiterates to me the orientation of local news. I'll probably try again later in the summer. I know a couple people with media contacts that might allow me greater success. Any suggestions from anyone out there would be appreciated! Oh yeah, one more update. I'm sticking to my rule of only running every other day since I'm feeling good and haven't had any problems with soreness, pain, etc. However, I'm now Elliott's full time caretaker and we both get a little bored hanging out at home all the time. 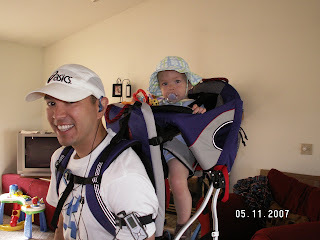 Therefore, my new crosstraining regime is to put Elliott in his Kelty carrier backpack and stroll around town with him. I figure its sort of like a mix of weight training and walking hills--his 20+ pounds are certainly noticable. I'm sure we are quite a sight cruising around town. For more information on World Lupus Day go here. 8 miles today. This was the first day when it felt really hot. 12 ounces won't cut it anymore. Overall though it was a good run. I'm turning in my grades tomorrow so that means more time for fundraising and more time for training. You will note that I have overhauled the website a bit. I wanted to give space to those businesses who have helped sponsor me and found a cool link to the donation website. The cool news is that it looks like Scott Sigler is going to help me design a shirt to help promote his books and is in exchange going to help send traffic to my donations site. This is no small favor either--Scott had over 30,000 people listening to his last podcast. There is a New York Times article about him that you can read here. Seriously, I think his fan-based grassroots approach to publishing is a solid one and a refreshing change from the conglomerates dominating mainstream media. Go to www.amazon.com and order copies of his books "Earthcore" and "Ancestor." They are independently published and good summer reads for science fiction fans. Or just buy them because Scott is a nice guy and supporting my run. 16 miles today at Shiawassee. The weather was awesome although windy. Hardly anyone was at the wildlife reserve, which was odd since the weather was so nice and it was packed when we were there a couple of weeks ago. My feet felt a little sore after running on the gravel even though I switched back to my Nikes. This is good information though as the race is going to be on trails so I will definitely need to look for a more sturdy shoe soon. I think that I finally figured out that I underpronate and need a cushioned shoe. Er, at least I think that is the kind of shoe I'm supposed to be looking for. My foot rolls to the outside so my shoes wear on the outer edge, but not too bad, which is why I can get away with the minimalist shoes I've been wearing. The big news is that I have been in contact with Scott Sigler and he definitely sounds interested in coordinating something to help raise money for Lupus. Scott, you rock. For everyone else, if you are at all a science fiction fan, I highly recommend that you start listening to Scott's podcasts (http://scottsigler.podshow.com). I think that T-shirts may be in the works--I'll keep you all updated. Holli and I are also planning a garage sale soon and are planning on donating the proceeds to the lupus foundation. We're considering making it a free garage sale with suggested donations for each item. 9 miles on Friday. It was really windy, which slowed me down quite a bit. I like running with Elliott, but lets just say that the jogging stroller is hardly aerodynamic. I figure its sort of like running on hills, which is good since there aren't any around here. Meeting a colleague at Shiawasee this afternoon for a long run. I'll probably run 5 miles or so with Elliott and Casey before heading over there. I've got this t-shirt idea to help raise money. I'll keep you all posted as I get the details figured out. I went just over 7 miles on Wednesday. We had some thundershowers on tuesday so I decided to skip my regular running day. The funny thing is the dog spent the morning very much under foot all morning. I'm convinced that he knew what day it was. Anyway, it was a bit cool and I mistimed my loops so I was only up to 7 miles when I came back by the house so I decided to call it a day even though it was a mile short of my goal. Sorry, this is a brief update. I have a pile of papers to grade before next week. The end of school is finally in sight!